At the Miao's New Year, the Lusheng performance troupe blow Lusheng to pray for good weather and bumper harvest. Attend Miao's New Year Festival. Participate in the celebration ceremonies, composed of Lusheng dancing, horse racing, rooster fights and buffalo fights. Learn to make Lusheng or try some farm work to experience the primitive local life. Explore Guiyang city freely and enjoy a Chinese Tea Ceremony in the evening. Transfer to the airport to catch the flight for your next destination. -- Accommodation in Guiyang, Leishan and Kaili for 5 nights. Deluxe hotels are 5 star, superior hotels are 4 star and tourist hotels are 3 star. 13 meals: 5 breakfasts, 4 lunches and 4 dinners. You will be met and welcomed by the guide in Guiyang airport. Guizhou is nicknamed "The Kingdom of Mountains", as 87% of its land is comprised of mountains and plateaus. Visit the Hequn evening market after dinner, which will leave you an impression of Guizhou's most popular and spicy food. We will leave Guiyang in the morning to drive for 2.5 hours along the scenic mountain roads to Kaili. In the local market, you will find lots of interesting things to photograph. Later pay a visit to the Kaili Museum, where you can get an overall view of the ethnic costumes in Guizhou. Today we will visit the Miao's New Year Festival, seeing the minority girls' traditional costumes and silver ornaments. 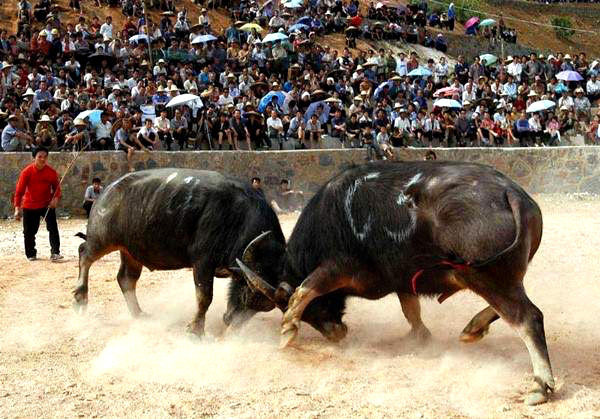 Participate in the celebration ceremonies, composed of Lusheng dancing, horse racing, rooster fights and buffalo fights. This festival also offers tourists a great opportunity to learn and join in the celebration dancing. Stay in local village (with clean bed sheet). Today, we will continue to experience the primitive local life. You can learn how to make Lusheng--Miao's musical instrument, or try to do some farm work (not heavy work) in the fields. Drive back to Kaili in the afternoon. Take morning coach back to Guiyang. An open afternoon is ready for you to explore the city. In the evening, enjoy a Chinese Tea Ceremony in a typical Chinese garden. Transfer to the airport to catch the flight to your next destination.